Muscles 101: Learn More About How They Work! How much do you really know about the human muscle? Most people have a vague idea of what muscles are and what they're supposed to do, but so many more lack a thorough understanding of how muscles work. Seeing as how there are 650 different muscles in the human body, we think it's pretty important to learn about them. Because we sell so many diet and exercise enhancement supplements, you can trust that the info you get here at QuickVita.com is based on the most relevant science available. If you stick around and keep reading, you'll learn more about muscles than you ever thought possible. What Are Muscles? What Exactly Do They Do? No matter how big and strong they look and feel, muscles are technically a soft tissue. All mammals have muscles, including humans. 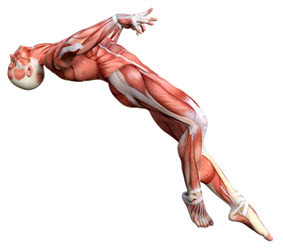 Muscles produce force and motion in a variety of different ways. Within the human body you can find two types of muscle: smooth muscle and skeletal muscle. The first type - and the type which gets overlooked most often - are smooth muscles. Unlike your skeletal muscles, you don't have any conscious control over whether or not you relax or contract of smooth muscle. Their motion is controlled by the brain via things like hormone regulation and excretion. Blood vessels, intestines, and organs like the uterus are all composed of smooth muscle. Then there are skeletal muscles. Skeletal muscles are the type of muscle tissue which cover your skeleton, hence the name. They are also the muscles which can benefit most from any of the fantastic pre-workout supplements you can find at QuickVita.com. They are connected to your bones with tendons, cartilage, and other important connective tissues. Without skeletal muscles, you wouldn't be able to move around. Skeletal muscles can be further classified into two different camps: type 1 slow-twitch muscles, and type 2 fast twitch muscles. There are some important physiological differences between fast-twitch and slow-twitch muscles. The type one, slow twitch muscles are typically used when you need to utilize a low force contraction, especially if the muscle needs to be contracted for a longer amount of time. Slow-twitch muscles have a greater number of mitochondria and capillaries at the cellular level, and higher amounts of myoglobin, too. These help keep the muscle fueled for extended contractions. When it comes to type 2, fast twitch muscles, it can get even more complex than that. There are three different subtypes fast twitch muscles: 2A, 2B, and 2X. Fast twitch muscles pick up the slack of slow-twitch muscles and get utilized whenever you need a more forceful, short duration contraction. This depletes the energy in your muscle very quickly, which is why it doesn't have the endurance of slow-twitch muscles. These muscles so go through the greatest change when someone like a bodybuilder goes to the gym and lifts a lot of weight. One of the best things you can do to live a longer, healthier life is to build and maintain as much healthy muscle tissue as you can. If you do manage to get to the gym regularly, then you should be taking a pre-workout formula like Ultra Edge XL before you start exercising. You can also take a dose immediately after your workout to boost your results and shorten your recovery time. This helps you get back into the gym more often and also helps your muscles grow bigger and stronger, faster. It's just one of the many health and wellness supplements that QuickVita.com specializes in. There are two different sources of energy your muscles consume: glucose, and ketones. Glucose can come from either dietary carbohydrates that you eat or from protein via gluconeogenesis. Ketone bodies come from fat. If both ketones and glucose are in your system, your muscles will prioritize burning the glucose first before the fat. But glucose prioritization may not be the healthiest thing. Part of the reason why high fat, low carbohydrate diets have become so popular lately is because of how they can improve athletic performance. This is more true for endurance sports than others. Although glucose is preferred by your muscles, it burns up quickly and is not so easily replenished. But if you train your body to prefer ketones instead - which is one of the many things we can do for you here at QuickVita.com - you will be able to work those muscles for longer because ketone bodies can be easily broken down from your fat. You won't need to drink a sports drink or replenish your glucose through dietary carbohydrate intake in the middle of the long marathon, for example. Following the high-fat, low-carb diet is the most efficient way to train your muscles to run off of fat as opposed to glucose. But not all athletes can benefit from using Ketone bodies for muscle fuel. Activities like HIIT cardio, martial arts, or sprinting - which require fast twitch muscle utilization and quicker fuel replenishment - cannot convert ketones into muscle fuel as quickly. Not only is anaerobic glycolysis much more difficult when ketones are the only fuel source, but it also reduces the amount of lactate your body produces. Many physical trainers and fitness experts think that you should produce a good amount of lactate for proper training. Regardless of the type of physical activity you prefer, you need to use your muscles if you don't want to lose your muscles. If you don't exercise enough and/or you are constantly restricting your calories to an unhealthy level, your muscles may begin to waste away. The risk gets even higher if you are older, if you have to go on bed rest, or if you're an astronaut. So, how much did you learn about muscles today that you didn't know before you read this? The good news is that this isn't all. If you bookmark QuickVita.com and check back frequently for new articles, you'll learn all sorts of new information that can help you achieve your health and wellness goals.